It seems ironic that while women control as much as 80 percent of the consumer buying decisions in this country and increasingly are taking the helm at businesses large and small, they are not represented on the bills in our wallets. There’s one woman who’s on a mission to change that — WIPP member Barbara Ortiz Howard and her nonprofit Women On 20s. Part of the Women On 20s mission is to have the new “woman’s bill” issued in time for the 100th anniversary in 2020 of the passage of the 19th Amendment giving women the right to vote. While no Congressional approval is required, the process of producing a new issue can take several years, from commissioning to design to minting. The organization believes the $20 bill is ripe for change. It’s due for a redesign in keeping with efforts to prevent counterfeiting. WIPP supports the Women On 20s mission and we hope our trail-blazing members will cast their votes beginning March 1st and take to Facebook, Twitter and other social media to spread the word. 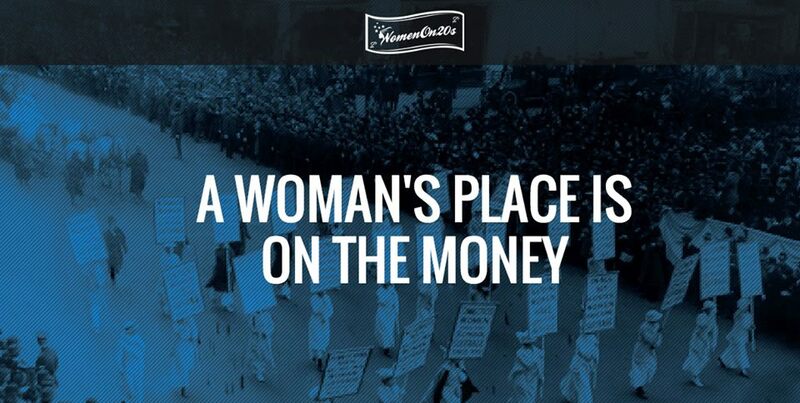 As the campaign’s slogan states — and we wholeheartedly agree, “A Woman’s Place is on The Money. This entry was posted in Women's Issues and tagged currency, women's issues by Women Impacting Public Policy. Bookmark the permalink.